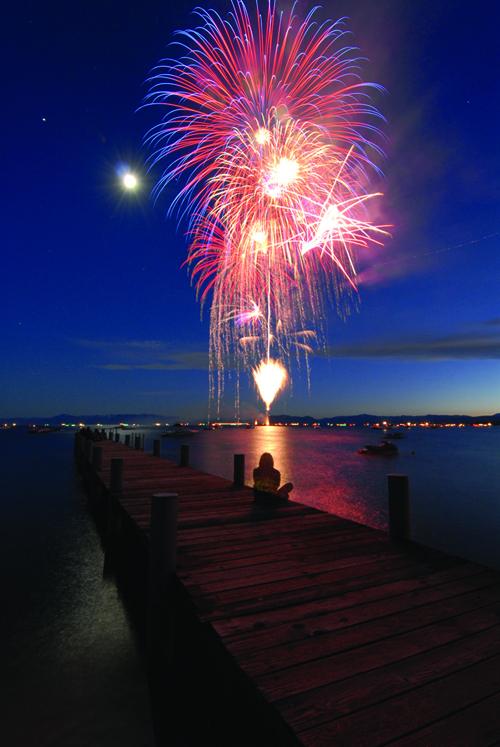 With over two dozen 4th of July events shining over the beaches, streets, and skies of Kings Beach, Tahoe City and Incline Village, North Lake Tahoe is the best place to experience America’s greatest weekend-long Independence Day parties, all culminating in three infamous fireworks shows. Be a part of Tahoe City’s 71st annual Funky Beach Bash and Fireworks party Monday, July 4. It’s an all-day family affair on Commons Beach and throughout Tahoe City leading to a massive fireworks show—the biggest to date—at 9:30 p.m. Enjoy live acoustic music by Mr. D. in the streets and music on the beach with local guitarist Kip Yager. A beer and wine garden is perfect for the adults with food and ice cream vendors spread throughout the festivities to cool down during the celebratory holiday weekend. The 37th annual July 3rd Fireworks and Beach Party kicks off the celebrations early with a party at Kings Beach July 3 from 4 – 10 p.m. Events like a beer, wine and mixed drink garden, sandcastle building contest and watermelon eating contest culminate in the bright firework display at 9:30 p.m. Admission to the event is free with preferred fireworks seating available on a first-come first-serve basis for $15 a seat. It takes a village to put on a great fireworks display, and the 10th anniversary of the Red, White and Tahoe Blue celebration does just that by praising the charitable causes, local businesses and Veterans that capture the spirit of Incline Village’s community. More than 20 events held throughout the 4th of July weekend from July 1-4 include Veterans’ recognition celebrations, Community Fair, a parade, and ice cream eating contest, all complimented by live music from MarchFourth Marching Band, the Air National Guard Band of the West, and the TOCCATA-Tahoe Symphony Orchestra and Chorus. The celebrations come to an explosive end at the specially curated Armed Forces Tribute and Fireworks Spectacular with a live soundtrack by the Air National Guard Band of the West. For more information on North Lake Tahoe’s lineup of Independence Day Weekend events, lodging options, and deals visit GoTahoeNorth.com/Fireworks. The post Independence Day Celebrations Bursting Across North Lake Tahoe appeared first on Go Tahoe North.